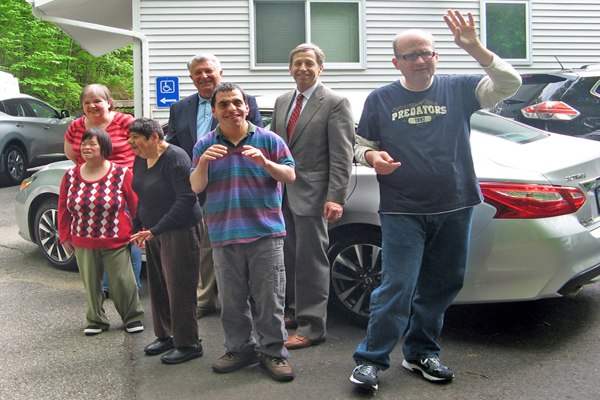 These six clients of The Kennedy Center are all smiles as they admire one of four new vehicles donated by the Norma F. Pfriem Foundation. Standing in front of the car is also Paul Miller, Chair of the Foundation, second from left, and Martin D. Schwartz, President and CEO of The Kennedy Center, center. These vehicles will be used to transport people with disabilities to work and throughout the community. The Norma F. Pfriem Foundation recently donated two vans and two cars valued at $110,000 to The Kennedy Center as well as additional funds for general support. These vehicles provide transportation to clients in residential services, employment services and students in transitional programs. Over the past several years, the Norma F. Pfriem Foundation has provided The Kennedy Center with new vehicles to replace their aging fleet. State funding does not cover the cost of replacement and the Foundation’s support has been crucial in helping the agency’s transportation services meet the mobility needs of people with disabilities. The Kennedy Center, a nationally accredited, non-profit, community-based rehabilitation organization, maintains one of the largest private, non-profit transportation systems in Fairfield and New Haven Counties. They operate a fleet of 172 vehicles, including cars, minivans, 15-passenger vans and cutaway mini-buses that seat 14-22 passengers. These vehicles average well over 1.5 million miles annually and provide approximately 125,000 trips per year. Kennedy Center transportation services run five days a week, Monday through Friday from 6 a.m. to 6 p.m., plus on an as needed basis over the weekends for clients who are residents in our 16 group homes or are involved in recreational activities. In addition to the 17 drivers in the transportation department, a large percentage of Kennedy Center’s staff members also transport clients to their various destinations, most of whom have a public service license for transporting groups of 10 people or more. In Fairfield County, The Kennedy Center serves nine communities: Bridgeport, Stratford, Trumbull, Fairfield, Easton, Monroe, Shelton, Norwalk, and Ridgefield. In New Haven County, the agency services clients in Oxford, Naugatuck, Milford, Orange, and New Haven.